An Emotional And Challenging Three-Year Long Development Process Now Comes To An End As We Present This New Flag-Ship Series In The Range. Never Before Have We Spent More Time In Front Of Curve-Walls, Design-Sheets And On The Water With A New Development Project Than With This One. These Rods Are Crisp, Light, Fast (But 3/4 Deep Loading), Well Balanced And They Carry A Raw, Stealthy Finish That Will Impress In Every Detail. Lpxe Details - By Incorporating New Graphite Structures And Cutting Patterns Guideline Has Improved The Strength Of The Rods And The Recovery Speeds In The Blanks Are Better Than Ever. Continuing On The Guide-Design Features Of The Rsi, Guideline Has Fitted Fuji Kw Stripping Guides On These Rods As Well. The Reduction Of Tangles With These Unique Frames Is Amazing And The Fact That The Kw Offers The Coolest Look In Fly Guides Today Is An Added Bonus. All Rods Feature Single Leg Guides Throughout The Rest Of The Blank. To Us, That Minimizes Weight And Unnecessary Stiffening Of The Blank And Adds To Its Performance. Lightweight, Yet Strong Reel Seats With Customized Details All Through, Match The Classic Semi-Matte, Slightly Transparent Blanks Perfectly. Grip Lengths, Shapes And Diameters Are Also New. Switch Rods Are Fitted With An Improved Version Of Our Unique Extendable Rear Grip. 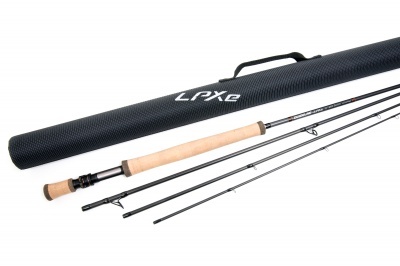 Lpxe Rods Come In An Air-Mesh Rod Bag And A Strong Lightweight Tube.